You can hardly overestimate the importance of PHP in today’s world of software development. It is powerful enough to be at the core of the biggest blogging system on the web (WordPress) and deep enough to run the largest social network (Facebook). PHP is an open source language, meaning that you don’t need a license to develop with it. However, PHP is quite complex, so you might need a certificate to confirm your skills. Zend certification is the best way for PHP developers to prove their skills and gain professional reputation. The Zend certification exam is anything but easy since it covers all aspects of the PHP language, not only the ones that you, for example, are currently using in your work. Getting a wider perspective on PHP is another reason to undergo the Zend testing. The number of certified developers at BelVG is steadily rising. 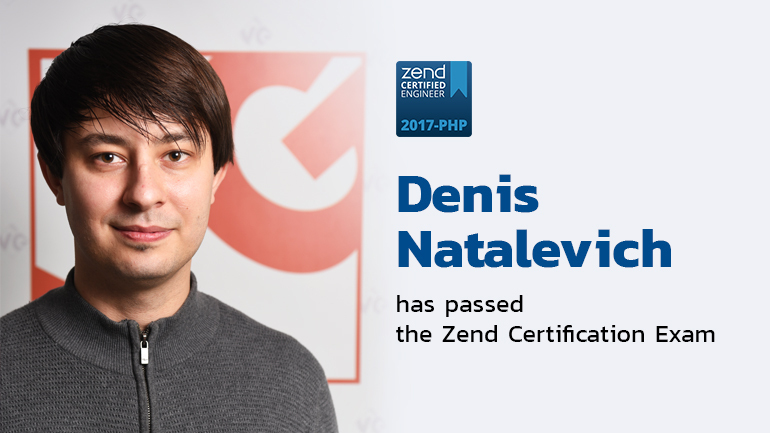 Denis Natalevich is now officially a new member of BelVG Zend Club. He completed his testing on September 17th and is now meets the highest requirement of the ecommerce development market. Denis has over 5 years of experience in software development. He has been with BelVG since October 2016. He is a Magento certified and PrestaShop trained developer and now puts a PHP Zend certificate under his belt. His hobby is quite peculiar — he is fond of ant farming. Discipline and hard work must be something that he and those insects have in common. During his work in BelVG, he was actively involved into the development of shopwithsocks.com and sortesokker.dk. Besides, he is quite a talented writer. You can take a look at his articles on our blog. Now there are 9 Zend-certified engineers at BelVG, all of whom are successfully putting the acquired knowledge into day-to-day work. We congratulate Denis on his new professional achievement and wish him luck and new professional challenges!